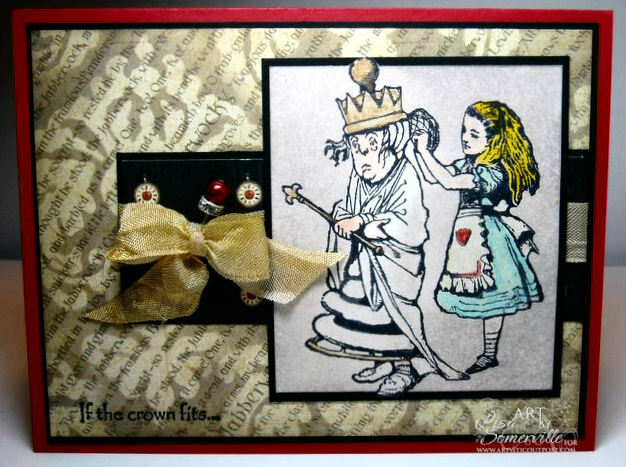 Designs by Lisa Somerville: If the Crown Fits and some news! If the Crown Fits and some news! It's time for another DT Challenge at Creative Inspirations Paint - this week Kassi issued the following challenge - ﻿Book Club.... find inspiration from your favorite book. I'll be honest with you, I'm so not a book reader, so instead I found inspiration using the Wonderland Collage Plate from Artistic Outpost, it's still a book theme, right! I combined this challenge with the Compendium of Curiosities Challenge - Mask Basics. I had a totally different project in mind for Linda's Challenge, but remembered I gave the mask I wanted to use to my BFF! Wanting to still play along, I found a way to incorporate the Challenge here on my card, by using the Damask Mask on my Graphic 45 paper. It works, don't you think? This week I've used the Creative Inspirations Paints as a resist. The image is stamped in Black, then painted and heat set. Why heat set you ask? I'm impatient when it comes to dry time and wanted to keep moving. I used the Out of the Box Technique to frame the image, then applied Pumice Stone Distress Ink with an Ink Blending tool, covering my Vanilla card stock and the image. Once the card stock was covered, I quickly buffed any excess ink from the image. This is my last post as a Creative Inspirations Design Team Member, as I'm stepping down to explore some other creative opportunities. Thanks Molly for having me as part of your team, I just love the shimmer your product adds to my projects! Looking for more inspiration using Creative Inspirations Paints, stop by the company blog and see what the other Design Team members created this week. Team B will be sharing more projects next week. Wonderful card using the Alice in Wonderland plate. Beautiful use of the damask mask. 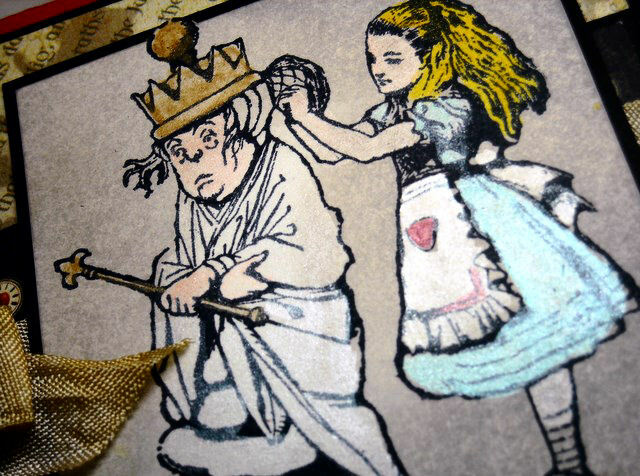 Very clever indeed GF, luv how you incorporated the paints into your bg, and Alice and Queenie are FAB! Beautiful card- love your technique and love the image you used. The paint is accented beautifully! We are going to miss you- and Congrats on your new DT with Heartfelt creations! The damask mask worked perfectly on the G-45 paper! The shimmer paints adds such a beautiful touch to Alice! Love this! Congrats again!!! great job! good luck on all your future endeavors! Wonderfully creative, Lisa, that's why you were on the Design Team! Great job with the colors and that damask background is regal! You've achieved wonderful results here, Lisa. I love how you have combined the challenges with such great effect. Love everything about this. great card, interesting technique, looks super! This card looks great, Lisa! I love the use of the damask mask! I'm sorry to hear that you are leaving the C.I. DT. I loved learning how you used it. Your work came out very nicely. I am sure whatever you jump into will be exciting and you will love to do! You are such a versatile artist! I think you found the perfect source of inspiration with this cool stamp set, and you created a completely fabulous card with it, Lisa! The Damask mask looks fabulous on the G45 paper-- like a professional print job, in fact-- central image is colored so beautifully! It's gorgeous, as always! Love the resist technique with the paints. The masking makes an awesome background. Great job Lisa!!! Good luck on your next adventure. We will miss you on the CI Blog. I am glad that we can keep in touch and still work together in other ways. Beautiful card! Love the image! Love the shimmer! Good luck on your next adventure! We'll miss you!